See what went on behind the scenes on launch day. 1. 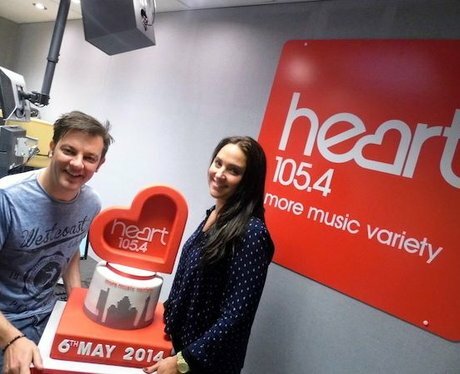 Joel and Lorna celebrate their first day in the studio with a Heart cake! 2. Lorna's proud of her new pen. 3. Joel kicks off his first day on Heart Breakfast. 6. Heart Angels celebrate the launch in Manchester. The Heart Angels at the wheel in Piccadilly Gardens. 7. The Heart Angels launch Heart in Piccadilly Gardens. 9. Joel and Lorna join the Heart Angels in Piccadilly Gardens.